Democratic, Republican or Libertarian candidates: Their political brains being wired differently, they provide American voters individual distinctions that are very much taken to heart. The 2016 presidential election was one of the most contentious in recent history, the outcome a surprise for the majority. And while some individuals vote based on family history or the state they live in, do they really know what their political party stands for? The Democratic and Republican parties were actually one party originally. Against the strong national government views of the Federalist Party, the Democratic-Republican Party was formed in 1792 by Thomas Jefferson and James Madison. “The Democratic-Republican Party supported states’ rights and the literal and strict interpretation of the Constitution. They also prioritized financial and legislative support of family-based agriculture. Due to immense fear toward anything that resembled England’s monarchy, Democratic-Republicans contested elitism. They despised and feared the Federalists, who were extremely wealthy aristocrats that wanted to create a national bank and emphasize the power of the national government rather than state governments,” according to todayifoundout.com. When the Federalist Party folded post-War of 1812, the Democratic-Republican Party experienced growing pains that saw a split. By 1828, there was the Democratic Party and the Whig Party. The Democrats’ platform focused on agriculture while the wealthier Whigs sought economic modernization. Enter the Free Soil Party prior to the election of 1848. Against slavery in the newly developing West, they served to essentially divide the Whig Party, which collapsed in 1852. In 1854, the Republican Party grew out of opposition to slavery by both Democrats and those originally from the Whig Party. • “Unrestricted competition among financial institutions, as well as the elimination of the Internal Revenue Service, Social Security and income taxes,” according to thehill.com. • Lighter punishments, plus rehabilitation, for non-violent criminal offenders, like drug dealers; no capital punishment. Who knows what political parties will arise before the next major elections. 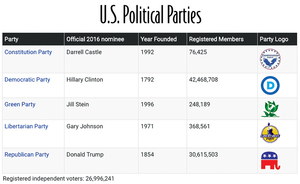 The Green and Constitution parties may gain more of a voice and/or become recognized in more U.S. states. Or the 30-plus minor political parties in existence may gain attention. With this particular set of elections concluded, Americans have some time to ponder what their true, individual wants and goals are for the future of this country, and Cabarrus County, and act on them.